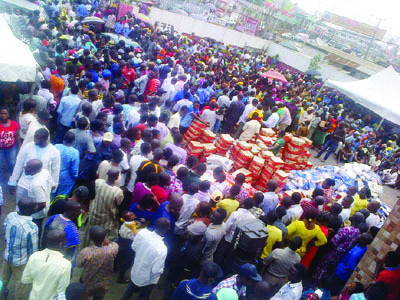 Thousands of residents of Ado-Ekiti and other communities in Ekiti State yesterday lined up for food items distributed by Minister of Solid Minerals Development Dr. Kayode Fayemi, through the John Kayode Fayemi Leadership Centre. Among those who stormed the centre on Ajilosun Road in the state capital as early as 8.30 am for an event scheduled to start at 10 am, were civil servants, commercial motorcyclists, artisans, nursing mothers, youths, students and the physically-challenged. Despite the scorching sun, they waited until the distribution started at about 11.45am with representatives of interest groups coming out to collect items on behalf of their members. The items were given to individual members. Items distributed include bags of rice, sugar, salt, semovita, packets of noodles, spaghetti, macaroni and wheat, among others. Fayemi said he was deeply concerned by the hunger in Ekiti, hence the gesture to distribute the items to the people to identify with them in their time of need. Speaking through the director of the centre, Biodun Omoleye, Fayemi advised civil servants and other residents to embrace farming to tackle hunger and boost food security. The former governor said the motivation behind the gesture was to assist indigent citizens and not to score a political point. Fayemi, who promised that the scheme would be regular, urged endowed indigenes and groups to assist the less-privileged. He said: “We are disturbed by the turn of events in our state where many of our citizens have nothing to eat and many go to bed hungry. We are carrying out this exercise to alleviate the hunger crisis in the land and offer our people a stop-gap approach to give them relief. “The wind of hunger blowing in Ekiti is unpleasant. It seems hunger is gradually taking over the land and that is why we that are privileged must continue to identify with the poor. This has no political, ethnic or political colouration, but just a means of helping the needy. “Taking cognisance of what is happening in Ekiti when we are reading in the newspapers that some civil servants are stealing food on fire, our people must embrace farming as a way of life. Food production remains the best for now and nothing more. “We must rise up to save our state and the future of our children. Some can’t be living in opulence when some could not afford one square meal a day. He added that the centre also plans to carry out leadership training for unemployed youths and more empowerment programmes will be rolled out for artisans and other interest groups. Calling on Nigerians to key into programmes of the President Muhammadu Buhari administration, Fayemi stressed that the change promised by the APC-led government was real as things would be done differently to the benefit of the masses. The minister added that Nigeria is in the era of change under a ‘focused and purposeful’ leadership, advising that people must key into the programmes of the Federal Government by learning how to do things in different ways.